There are few things worse than waking up one morning to take a shower only to find that your water is an unpleasant brown colour. There could be different causes for the colour change, but there is no reason to panic. Try to pinpoint the source of the discolouration so that you can know the right people to call for help. Occasionally a section of pipe or part of your hot water heater will rust and mix with the water running through your pipes. 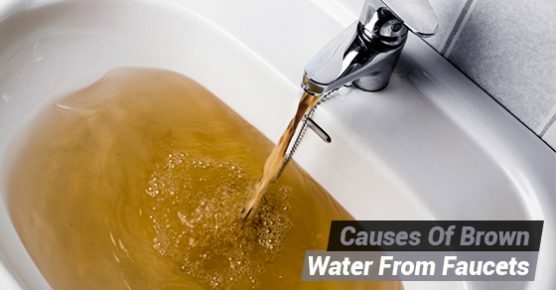 This will cause your water to have a brown, red, orange, or yellow tint. Drinking this coloured water in small quantities will not do you harm, but leaving your pipes rusty could gradually contaminate more of your water with bacteria, and cause leaks and damage to your home. If you want to clear the loose rust out of your pipes, you can run your water for 10-20 minutes. After this time, if the problem was rust, the water should come out clear again. If you have run your water without successfully flushing out the discolouration, you may have an entirely different problem. When your water is supplied from your city’s municipal system, sediment could be the source of your tainted water issues. If the brown water is coming from all of your sinks and does not change, regardless of whether you run it hot or cold, this is likely the case. Before you try too hard to solve the problem on your own, call the city to see if they are aware of the issue. The brown water could have been caused by a broken water main or nearby fire hydrant. Either of these would cause sediment to stir around and mix into the water supply for a day or two. But if the problem lasts longer than a day, you should call the city to make sure that the issues will be taken care of. In the meantime, you can call a plumbing professional for a fresh water supply for cooking, drinking, and washing until the city has resolved the problem. You don’t have to live with brown water. While brown water won’t cause you any major harm, we understand that nobody wants to look at it, taste it, or think about it. We will be there to help you get clean water as soon as you call. Contact Advanced Plumbing for assistance from one of our professional emergency plumbers today!